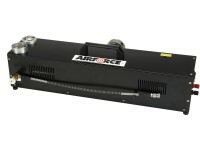 Air Venturi Power Booster 4500 psi Unit. Compressors. 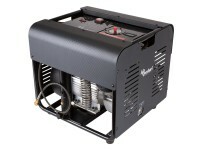 This unit requires a shop compressor capable of a working output pressure of 60-90 psi. 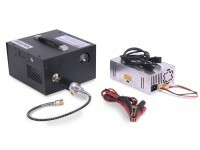 It is recommended that your shop compressor be capable of at least a 5 CFM flow rate. Less than 5 CFM will produce slower fill times. This Booster should not be used for breathing air. 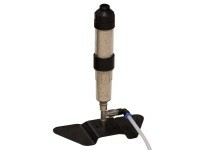 The Air Venturi Power Booster creates independence from conventional fill sources. Finally, freedom from the SCUBA shop! 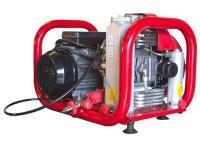 The Power Booster is capable of operating in conjunction with an existing shop compressor to provide up to 4500 psi. 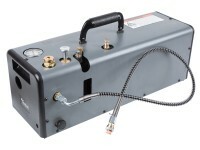 The shop compressor acts as the first stage, feeding up to 90 psi to the Booster. 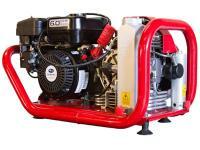 It is recommended that a shop compressor capable of delivering 60-90 psi at 5 cubic feet per minute (CFM) is used. A compressor producing less than 5 CFM may result in slower fill times. The Power Booster is light weight, compact and far less expensive than a more conventional, stand-alone high pressure compressor. 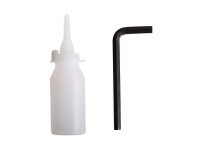 No more traveling to a SCUBA shop and no more time spent operating a hand pump to fill your PCP air guns. 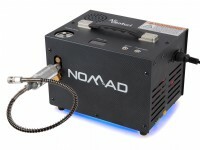 This Booster unit cuts out the middle man and (in the case of a hand pump) the physical strain. Welcome to the era of Air Independence! NOTE: Shipping of the Booster may be delayed up to one business day. Things I liked: Quiet, simple, much quicker than hand pump. Since there are no electric parts and it is lubricated it will probably last a long time. Things I would have changed: Oil definition should be communicated even ahead of ordering. Standard description that it is not included as well. What others should know: Should be specific on what oil is needed. Used synthetic compressor oil. I am sure standard hydraulic would be bad as listed in the manual. Viscosity is significantly different for hydraulic oil. Pressure and CFM has to be enough to actuate the booster. 50 psi at least needed to get to 3000psi out on the booster so 60:1 boost. 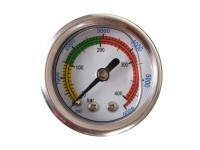 It is needed to be close to this pressure and at least 3 CFM available to make it actuate. You will need 75 psi at that rate min to get to 4500 psi and actuate, and it will be slow or you will use the booster on / off to build enough pressure and continue pumping. This will make it even slower. This is ok for me I already have the compressor and it is way easier than hand pumping. Unless I purchase a bottle I will likely never need to go above 3000psi at least with the guns I own now. Things I liked: It is simple to use. Works great for filling guns. From 1000psi to 3000psi takes about 1:32 to fill the Gamo urban. 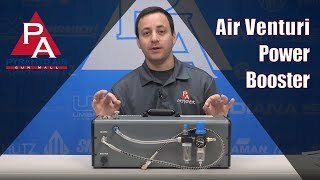 Does this boost the same 90 psi air that's coming from the shop compressor, or is it boosting "ambient" air? It is not made by either manufacturer. It is made in China. Sold in Europe under the Gamo name and in North America under the Air Venturi name. I just received the AV power booster, and would like to know what the two tools are that came with it. The manual has no mention of these. The first one is a t-shaped handle or wrench of some sort. The other is a cylindrical metal tube opened at both ends roughly an 1 1/2 " long. There is also oil in the reservoir already when delivered. Is ok to add compressor oil to it? The oil that came in it is clear. My compressor oil is amber colored. Not sure if it is compatible?. Any help please! 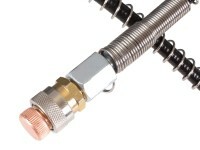 The tool/allen key should be for adjusting the output pressure. Not sure about the metal tube. You can add compressor oil, that should be no problem.